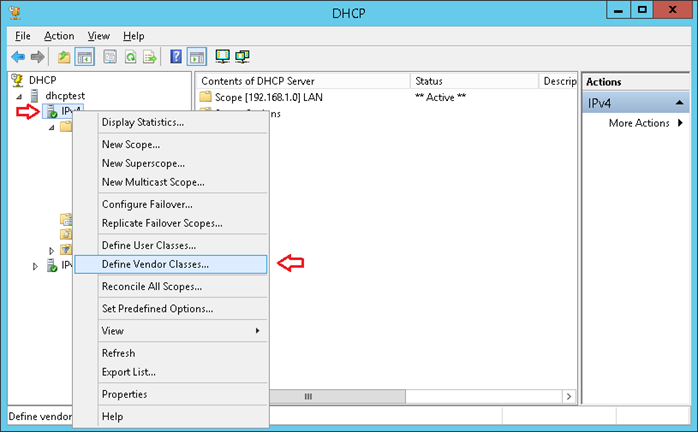 If you prefer not to use our WTDHCP service, then to configure DHCP server this manual for Windows Server 2012 will be useful to you. Many thanks to our user Rushmore for this work. Let's work with simple network 192.168.1.0/24. Router to the outside world is 192.168.1.1, at the same time it's DNS server. 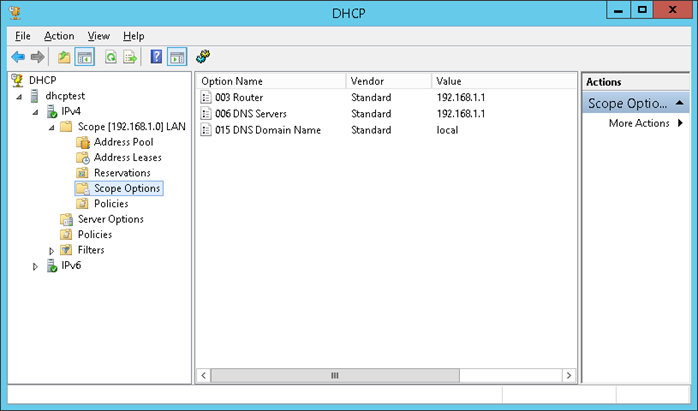 DHCP server is 192.168.1.2. Install on it Windows 2012 R2, add DHCP Server role. 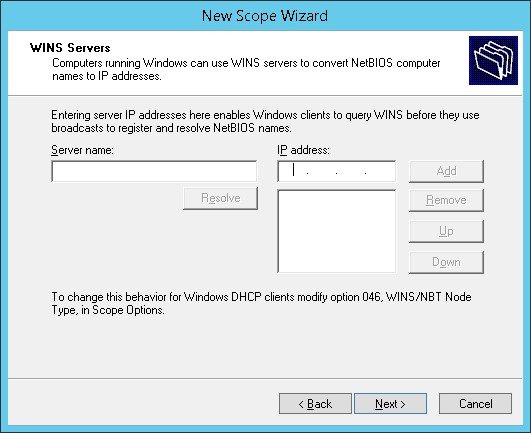 Server must have static IP address! Terminal server is 192.168.1.3, with WTware 5.4.16 istalled, all settings are default. 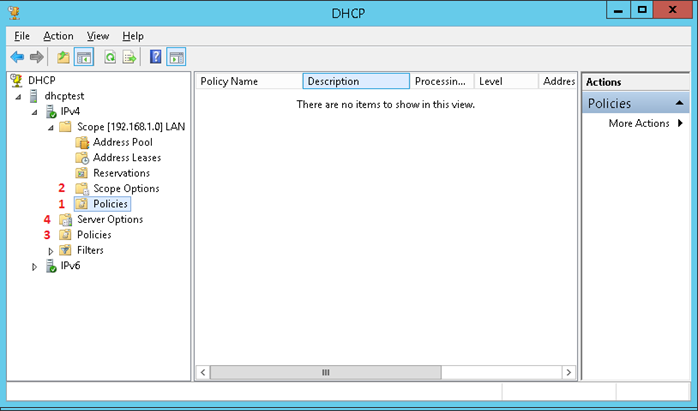 WTware DHCP turned off, TFTP turned on. 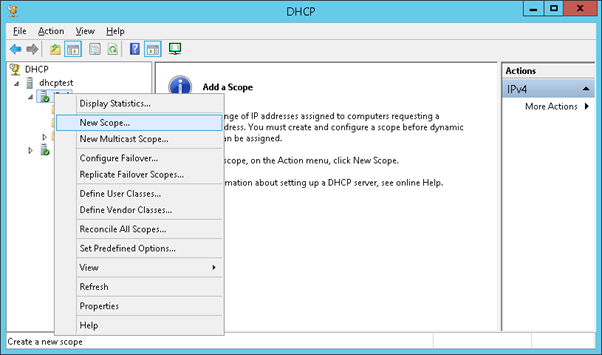 Login to DHCP server as administrator, run DHCP control console. 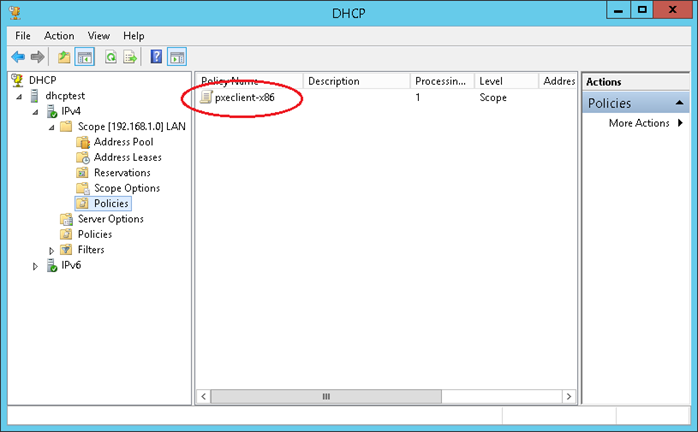 Exclude first 15 addresses from DHCP distribution (or you can add all static addresses to reservation later). Do not change default lease duration. DNS server address and domain name (if needed). WINS — specify, if you use this anachronism. 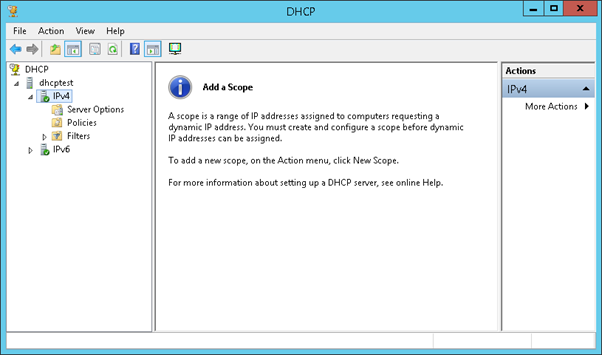 At this stage workstations will receive addresses and basic settings from DHCP server. Now let's start configuring network boot. 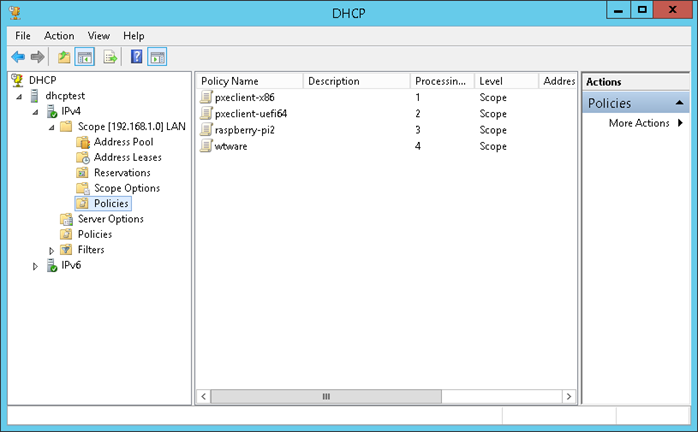 To determine needed boot files we'll use DHCP policies. DHCP policy is the rules, that help to asign IP addreses and/or DHCP options for the clients, that match policy conditions. Scope Policies in order of priority. 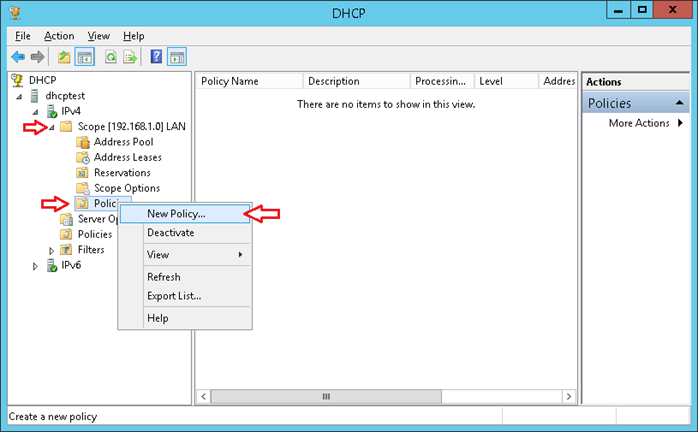 Server Policies in order of priority. Each policy has it's own priority. Priorities are numbered starting from 1. Policies with less numbers have higher priority. 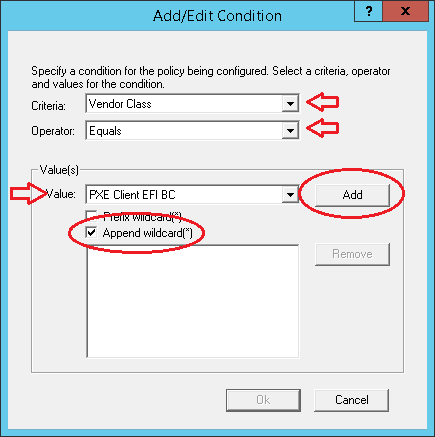 If the same options are specified in two policies, then client will receive the option from the policy with higher priority. 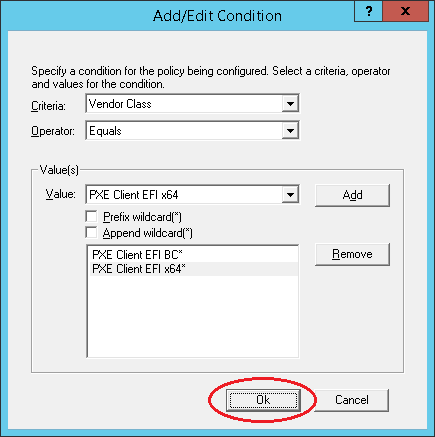 Policy priority can be changed in GUI: in policy context menu choose "Up" or "Down". Policies do not apply to specified in Reservations MAC-addresses! DHCP Relay, that responds to client. 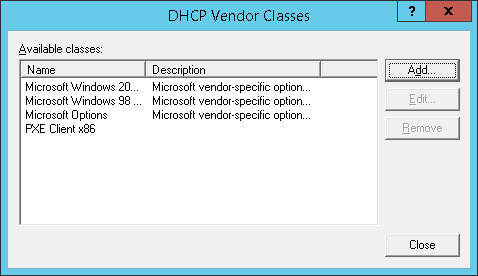 We are interested in Vendor Class now. 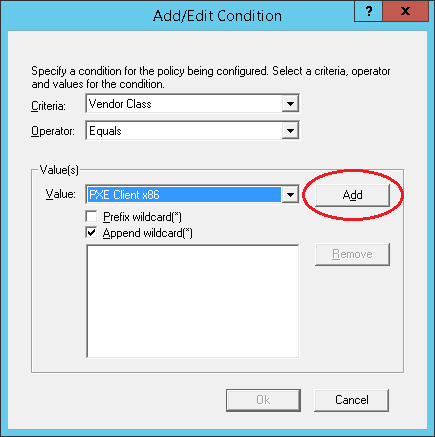 To add policy you need to create needed Vendor Class. 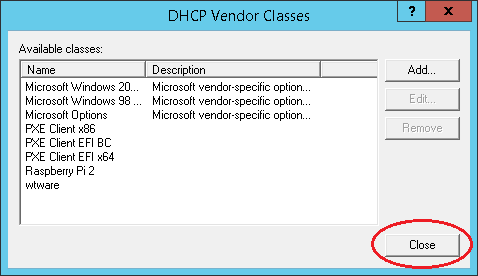 Press "Add…" to add new Vendor Class. 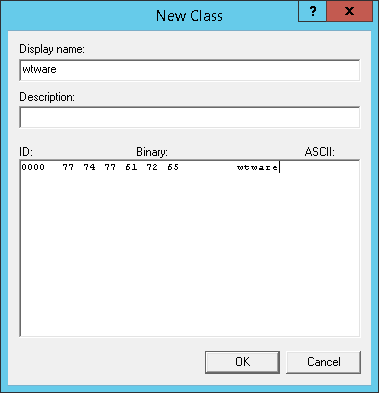 Data should be either Binary (hexadecimal values), or ASCII (just enter text). Make sure you entered correctly or nothing will work. Classes are ready. 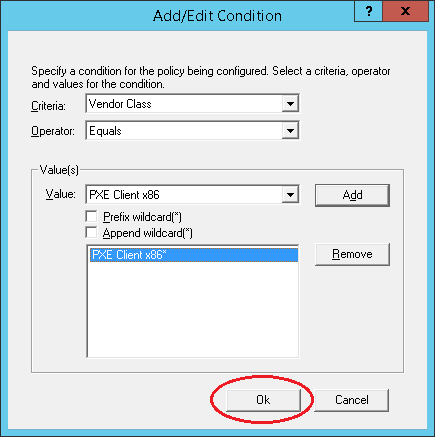 Press "Close" and proceed to adding policies, that our classes will use. Policy will determine the way of clients' boot in BIOS. 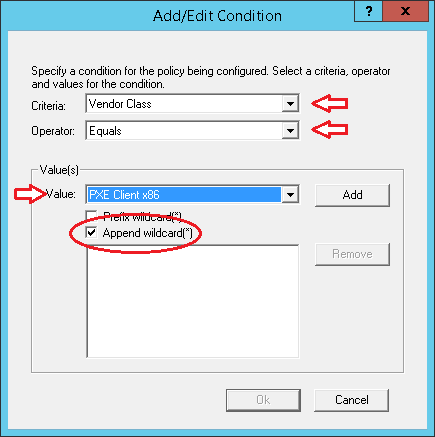 Pay attention to "Append wildcard(*)" checkbox. 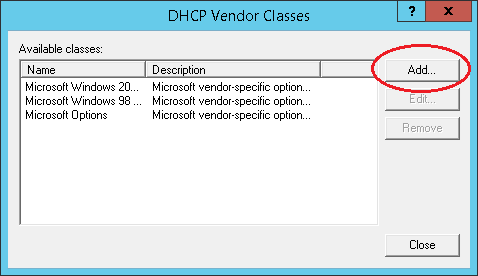 It means that any Vendor Class, that starts from "PXEClient:Arch:00000", corresponds to policy condition. Condition is ready, press Next. We don't need IP reservations, so press No and Next. 192.168.1.3 — is address of our TFTP server, where WTware boot files are stored. Press Next, policy configuration is finished. 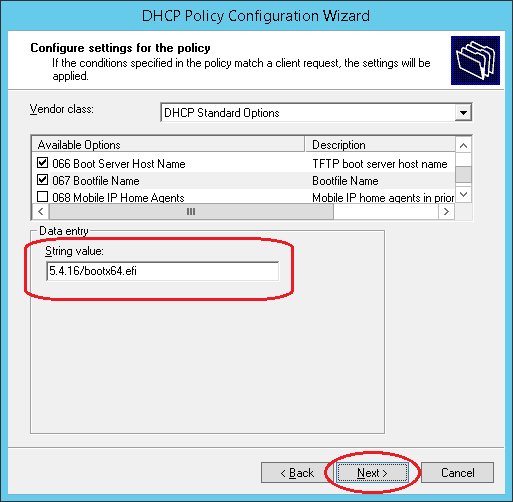 Skip IP addresses configuration as for previous policy. 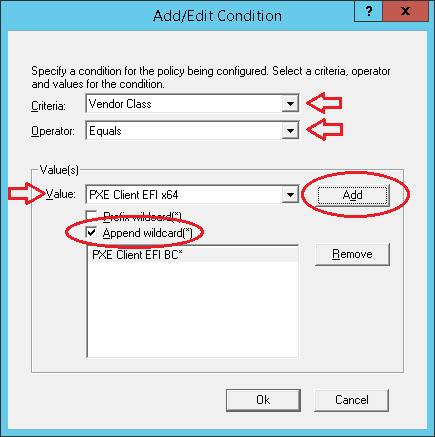 In policy condition specify Vendor Class "wtware"
For HTTP boot 67 option = 5.4.16/http.efi (specify this file name or UEFI boot won't work by HTTP). 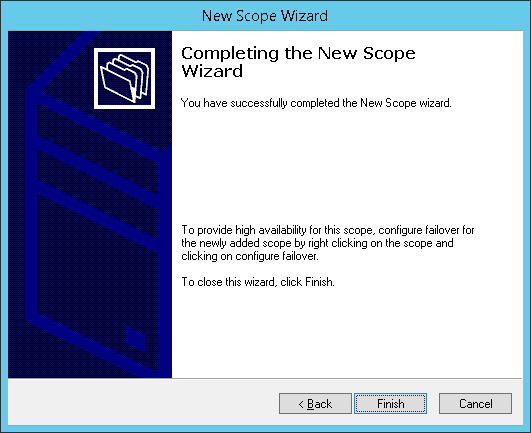 Also special WTware 18 and 179 optiona may be added here if needed. Configuration is finished. All client types should boot successfully. Surely, it's the most simple example. In real networks everything is more complicated. 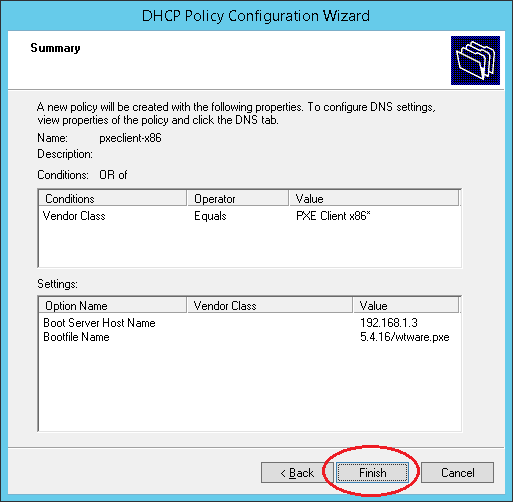 It's important: for policies are not compatible to reservations, if you need to specify hostname (12 option) or to reserve static address for some client, add new policy with "MAC-address" condition and configure needed parameters for this MAC-address in policy options.